Any of us who are familiar at all with Miss Charlotte Mason are familiar with these tenets. These tools are one of the things that we have in our toolbox as parents to help train and guide our children, to teach them good habits and good ideas. We spend our days filling them with noble thoughts, with truth, with goodness, with beauty. We help them learn how to think critically and how to logically approach life. Sometimes, though, in the midst of all this habit training, and all of this trying to instill diligence and good attitudes, it feels like everything that we’re doing is in vain. I don’t know about you, but sometimes I feel like I need that hung up right in front of me, wherever I’m standing, be it at the kitchen sink, the bathroom counter, or perhaps in the grocery store on aisle five, when my child starts pitching a fit because they’re a little overtired. You are doing something amazing. We are raising a generation of world changers. That’s not small. That’s not insignificant. We are bringing up our children with high ideals, and moral standards, and values that we want them to cherish as deeply as we do. Will they change as quickly as we want them to? Probably not. We often don’t change as quickly as I’m sure God would like for us to. But we must remember, as we toil away at habit training our children, at modeling cheerfulness in chores, while we smile as we do dishes at the kitchen sink, while singing our favorite hymns as we put away those mountains of laundry, we are helping set an example, as we’re disciplining them and guiding them in the way that we would have them to go, and sometimes it feels very isolating and very lonely because the world doesn’t see the beauty in the things that we see beauty in. They don’t look at orderliness the way that we do. They don’t look at tidiness, they don’t look at spending dedicated time in your Bible every day, the same way that we do. These virtues that we are working to instill in our children are creating a fertile soil for the Holy Spirit to take over and actually make those habits take hold. So, friend, today I would ask you not to give up. I would ask you to hold tight to that, “I can do all things through Christ who gives me strength,” and to continue on this fantastic and sometimes arduous journey of raising our children well. While the habit training may not be where you want it to be right now, always remember that our children are just not there yet, and we are able to lead them, and to guide them, and to discipline them, and to disciple them, and to give them a wonderful, wonderful education. 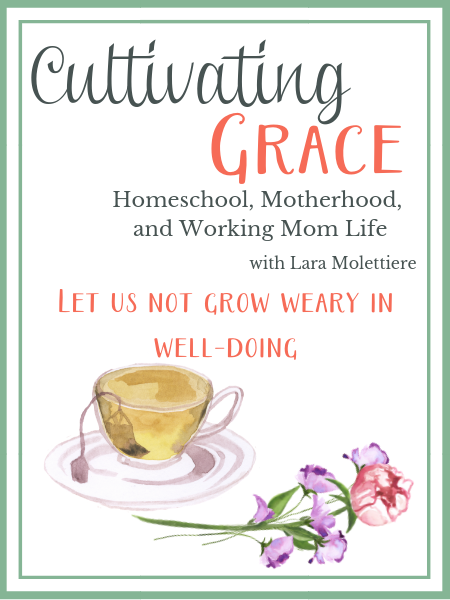 Love homeschool encouragement? Join our email community for weekly tips, encouragement, and homeschool ideas! It’s so integral to who we are and who we are becoming–even as adults.